LUCY BANNERMAN and TOM GORDON December 29 2005 in the Herald. After 30 years of secrecy, declassified documents have revealed the scramble among senior officials to feed the Scottish public a poisoned pill of devolution. The correspondence, which circulated behind the scenes in Whitehall in early 1975, unveils efforts to persuade Scots not to vote for independence. The SNP movement, officials admitted, was winning over moderate public opinion and a counter-attack was needed to neutralise the Nationalists' "trump card," oil. Some of the most candid language emerges from the correspondence from John Crawley, a civil servant who had been nominated as a "link-man" to liaise between two policy units set up to oversee the devolution strategy. In a letter to another cabinet official, entitled Devolution and Oil, Mr Crawley conceded that the SNP slogan, "It's Scotland's Oil" was a difficult one to counter. On April 15, 1975, he wrote: "I doubt whether one can prove that an independent Scotland would be a disaster for the Scots – at any rate while the oil lasted. Two points, however, occur to me if one is going in for this sort of speculation. "First it might be useful to have an established view as to just how much North Sea oil would, in the event of Scottish independence, be 'Scottish oil'. The general assumption, which may well be right, seems to be 'most', if not 'all'." At this point, Mr Crawley suggests it might be in the interests of the anti–nationalist lobby to exploit tensions between Orkney and Shetland and the mainland. 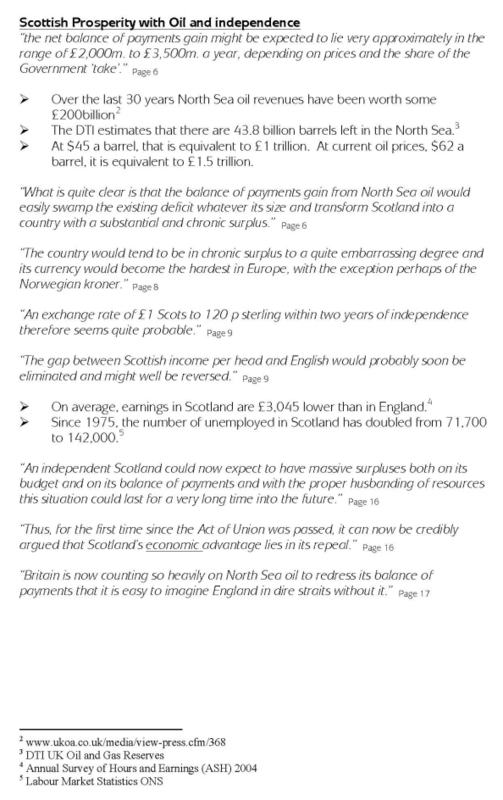 One eight-page document from the Central Policy Review Staff, one of the policy groups within the Cabinet Office, makes clear the need for ministers to discredit claims to oil. It reads: "The various constraints available to a Scottish administration would be weakened and the counter-measures available to the UK government would be strengthened if it were possible to discredit the assumption that in any confrontation the Scots hold the trump card of opting for independence. "The Scots could no doubt inflict great harm on the rest of the UK by playing this card. If it could be demonstrated with conviction that they would also inflict great harm on themselves the card would cease to be a trump. Further proof of this Whitehall agenda lies in another letter, from John Garlick, head of the Constitution Unit – the other working group – to the Department of Energy. 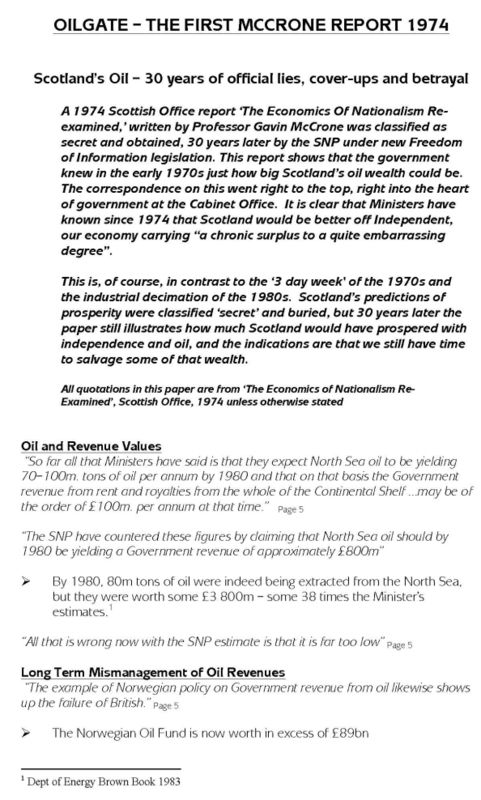 He wrote: "It seems desirable for us to attempt some objective assessment of the strength from Scotland's point of view of the economic case for Scottish independence; and of any disbenefits which Scotland would have to incur in order to secure the oil. "It may be that this assessment could be used to demonstrate that independence would in fact operate to Scotland's economic disadvantage." Alex Salmond, SNP leader, said: "This indicates the extent of the conspiracy stretching through the government into the the civil service to cheat Scotland out of its oil wealth. "It's clear there was no tactic too despicable to be used given the extent of the electoral threat posed by the SNP. "These documents are quite devastating in shredding any impression of civil service impartiality or any thought whatsoever that the Labour party had Scotland's best interests at heart." However, Brian Wilson, the former Labour Scottish Office minister, responded: "Under any government, civil servants prepare advice which is in line with the policies of the incoming party. "It would be surprising if they had not prepared counter-arguments on what was the hottest political issue of the day. The arguments sound very obvious and reasonable to me."